﻿Trinity Sunday: Calendar, History, Tweets, Facts & Activities. Trinity Sunday honors the Holy Trinity and serves as a reminder for all it has done to salvage humanity from its sins. The Holy Trinity is the Christian belief that God consists of three distinct persons - the Father, the Son and the Holy Spirit. Theologically, the Trinity is a common thread amongst most Christian faiths. Trinity Sunday falls on the Sunday following Pentecost. The Trinity does not explicitly appear in the Bible. The interpretation and belief in the three-in-one God came out of several councils in the early church that wrestled with the question of the divinity of God the Creator, Jesus Christ and the Holy Spirit. St. Patrick, the patron saint of Ireland, taught non-Christians the Trinity with a shamrock. The Orthodox Church celebrates the Trinity in its Feast of the Pentecost. Pentecost Sunday is sometimes even called Trinity Day. The Trinity is often described as a holy mystery beyond complete human understanding. To mark Trinity Sunday, consider other things that are beyond human understanding, like the universe, or the concept of time never ending. 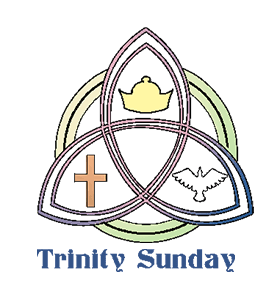 Listen to a sermon on Trinity Sunday to see what examples the pastor uses to illustrate the concept of God in three persons. Johann Sebastian Bach wrote music to celebrate the Trinity. Listen to one of his Trinity Sunday cantatas on YouTube. Experience the Trinity in art at the Metropolitan Museum of Art in New York City. One painting that depicts this is The Trinity by Italian painter Angulo Gaddi.